I acquired this handset (Fig 1 below) when I was about 7 or 8 years old - 1956 or 57. It came from my father's workplace at Huddersfield Technical College. The Textile Department had moved to a new building near the ring road. The old premises in Ramsden Street were due to be demolished. Before the demolition my Dad and I rescued bits of the Dictograph intercom for reuse. The handset became part of an intercom between my bedroom and that of the next door neighbours' children. Before we look closely at my handset, let's find out about the development of the handset. The leading manufacturer to champion the cause of handsets was Lars Magnus Ericsson. Fig 2 on the left shows the progression of Ericsson's handsets. 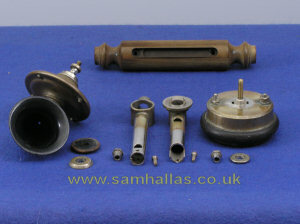 The earliest are little more than a carbon microphone and a Bell type receiver joined by a rod acting as handle. Improvements in magnet technology gradually allowed the receiver to shrink to the final size shown for 1921. [Picture LM Ericsson, used with permission]. 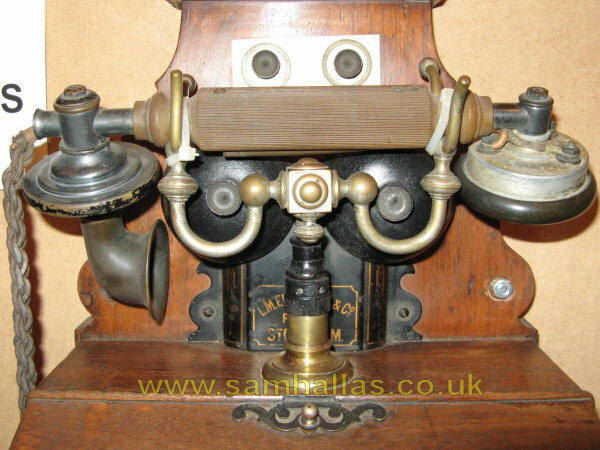 The British Post Office's first handset telephone appears to be Telephone No 16, introduced about 1895. Fig 3 (right) shows an L.M. Ericsson wall telephone in the collection at Milton Keynes Telephone Museum, which appears to be a Telephone No 59. You will see that the handset is virtually identical to mine in Fig 1. The Post Office designated this handset Telephone No 28, although on its own it was not a complete telephone. The cradle rest in Fig 3, though similar to mine, is slightly different in detail. 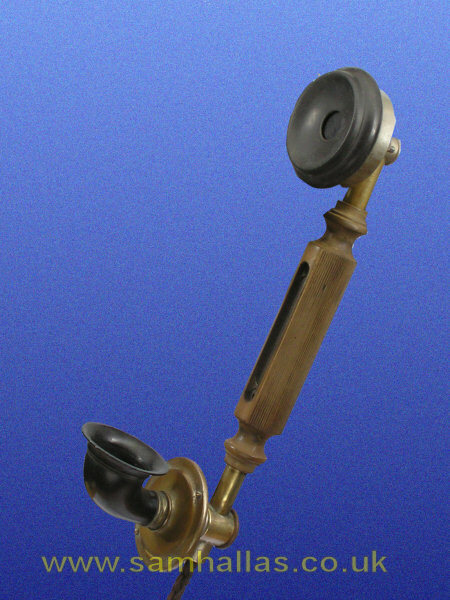 The handset (Fig 4 left) consists of five major components: the handle; the transmitter support; the transmitter itself; the receiver support and the receiver. [Fig 5 right] The handle appears to be Ebonite. The receiver earpiece may also be Ebonite. The transmitter horn is probably bakelite. 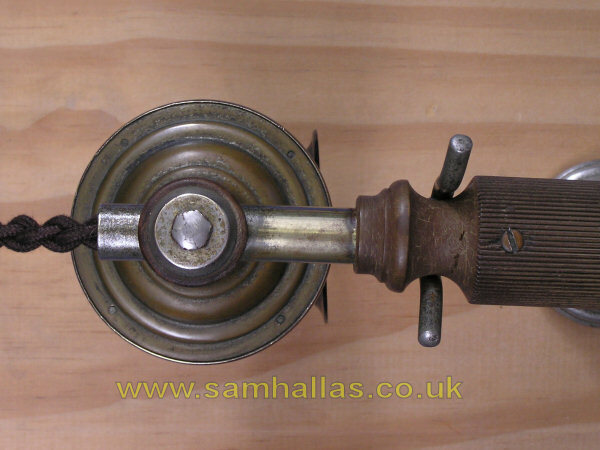 The metal parts are brass with a partially worn away nickel coating. Figs 6 and 7 above show the transmitter and receiver, held in place by the hollow screws with 2BA heads. The transmitter has an insulated washer because the centre mounting pillar is one electrical connection. A plain metal washer is on top for decorative reasons. 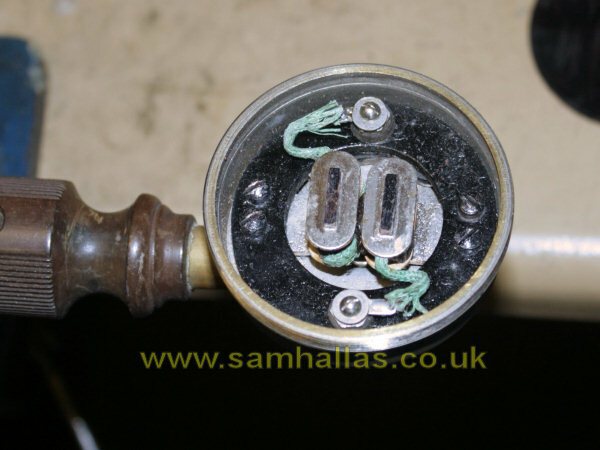 The other electrical connection is via the case. The receiver has a plain washer since its electrical connections are to the case and the insulated terminal seen with the green wire. The nuts are 3BA. 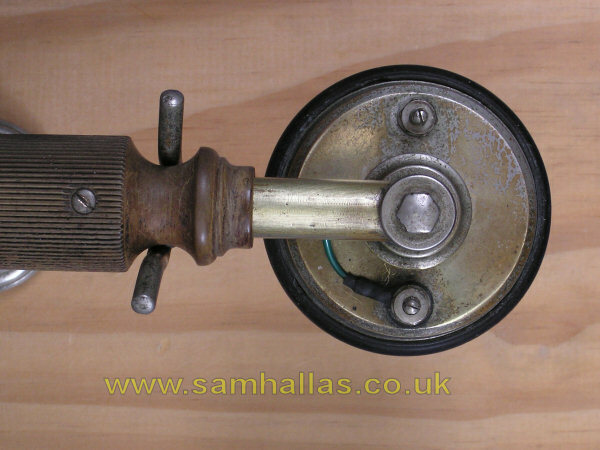 The support pieces are held in the handle by the countersunk screws visible in the pictures. Fig 8 shows the transmitter interior. 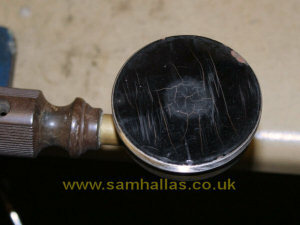 To the left is the diaphragm, turned over to show the carbon coating. I mounted the handset in a vice to prevent the carbon granules from being spilt while I took the lid off. The granules are held in a piece of white felt with hollows in a star formation. 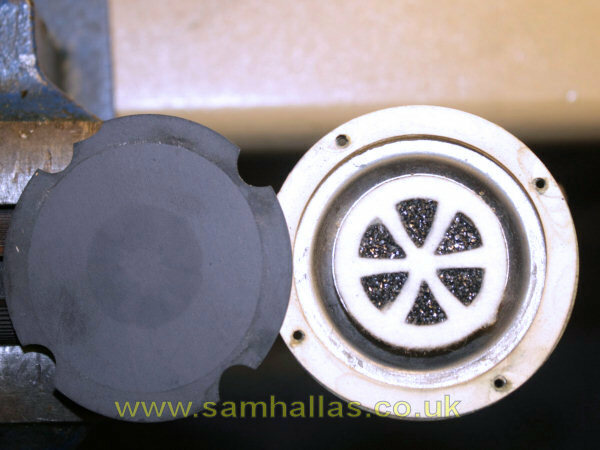 The carbon block has a star shape to match the felt granule holder and is connected to the central mounting pillar. The diaphragm is coated with carbon and connects back to the metal case at its edges. Fig 9 is a diagram from Ref 1 showing the Ericsson 'star microphone' from 1903 which is evidently the pattern for my handset's transmitter. Fig 10, left, shows the receiver diaphragm and Fig 11, right, shows the interior with the ring magnet and coils. 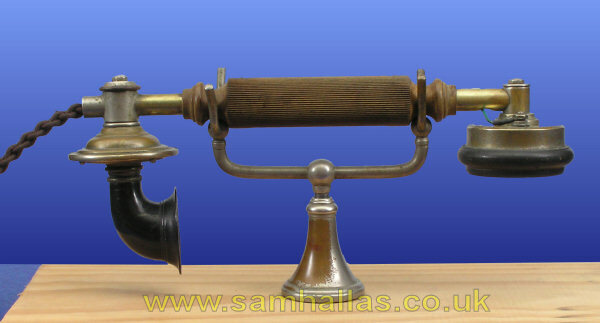 2. www.britishtelephones.co.uk for articles about Telephones No 16, 28, & 59.